Human Computer Interaction (HCI) has been evolving for the last 30 years in respect to achieving a natural feeling, by mimicking the human-to-human interaction and by involving various means: movements, vision, and speech. The HoloLens advanced technology from Microsoft, which enables high-definition holograms to come to life in a mixed reality environment, is looking to re-shape the way we are going to communicate, learn, work and play in the future. The extremely ambitious Augmented Reality (AR) wearable system allows overlying 3D images on the physical real world elements, such that they are perceived to exist together in a shared environment. The Microsoft HoloLens system has more computing power than today’s average laptop, but is designed considering user comfort as a key feature. It comes equipped with advanced sensors (e.g. energy-efficient depth camera with a 120˚x120˚ angle of view, microphone array, photographic video camera, inertial measurement unit, etc.) and specialized components that allow fast processing of a large amount of data per second. Their weight is well distributed around the crown of the system to allow for free movement and interaction with the holograms. The headband and the visor can move independently of each other, and the system doesn’t rest on the nose, which makes it possible to also wear glasses while using it. Microsoft encourages application developers and entrepreneurs to come up with new ideas and applications to shape the future of mixed-reality environments. They have started from the gaming experience, by organizing hands-on boot camps for developers to build their own application in the Unity game engine. Furthermore, the academic use of the HoloLens system is encouraged through research grants for visionary applications that will help people in the future to create, learn, collaborate, and play in new ways. OnSight will enable scientists to work virtually on Mars, by creating a 3D simulation of the Martian environment using the real rover data. Case Western Reserve University and Cleveland Clinic collaborate with Microsoft to re-imagine learning in the human anatomy class and create a full digital anatomy curriculum. Currently, the HoloLens mixed reality environment allows students to see the human heart in true 3-dimensional space, to take parts in and out, to turn it around, and to see the blood pumping in the heart. 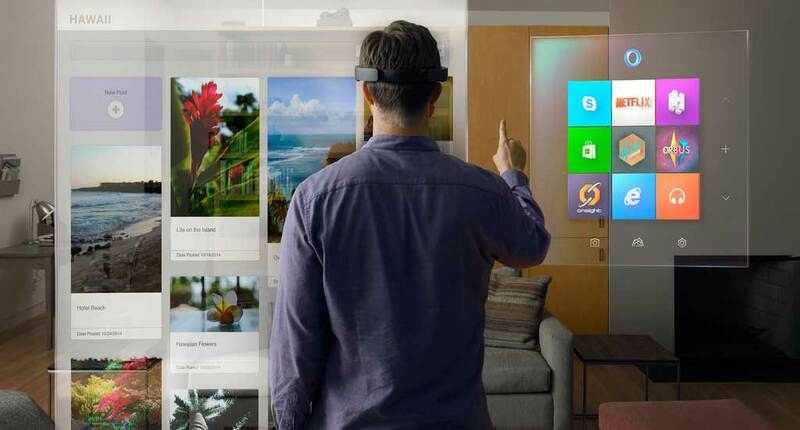 HoloLens is already a step ahead of its competitors, being supported by Windows 10, which supports holographic computing systems with Application Programming Interfaces (APIs) that enable gaze, gesture, voice, and environmental understanding of an untethered device. Affordability – the commercial aspects regarding price and licensing terms have still to be defined by Microsoft. We are looking forward for more truly innovative applications of this cutting edge technology of the future.